Canyon Campground in Peter Lougheed Provincial Park is one of the most kid-friendly campgrounds that we’ve stayed in, without being filled with campsites too close to one another. It’s popular, there’s going to be a handful of kids, but still very quiet. Most people choose to camp in the nearby more popular campgrounds. There’s a big bike loop around the sites in Loop B that enable you to see your child for 90% of their lap, a campground in the middle of the loop and green space all around, surrounded by mountains. Loop B has the features that we mentioned above and has an open meadow, with a hill you can climb to reach a beach area. The water’s too cold to wade in, but you could bring along kayaks for an adventure in the water where you’re not going to get too wet. When it comes to choosing a site in the campground, Loops A and C are more the traditional campground, with the tall trees. If you’re camping with kids, Loop B in the meadow is going to make it easier for you. The kids spent hours at the playground and racing their bikes around the track. Getting there | Canyon trail wasn’t available, but there are multi-use trails all throughout the campground, and to the visitor’s center (3km away). While you’re there, you can rent equipment at Boulton Creek Trading Post, do it right at the campground or check out the visitors center to see options in the area. We chose to do the hike at Cat Creek Falls, and it was fantastic, one of the best hikes we’ve done this year with the kids. Cat Creek Falls is about 45km away from the campground, but you don’t have to go that far for adventure, there are lots of things to discover nearby. 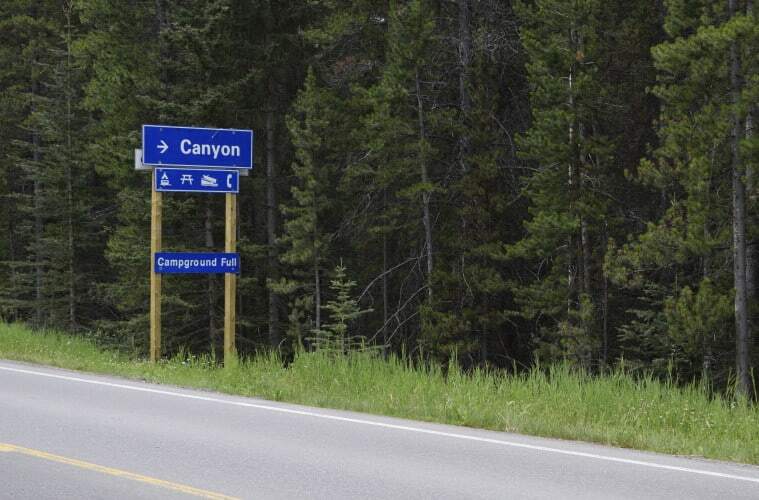 There are no reservations for Canyon Campground. It’s first come first serve and by Thursday night, there were only a couple of sites left on Loop B to choose from. The prime spots, close to the playground, went fast. The rate is $26/night, and there is no power at the campground. Be Bear Aware. A young bear made its way on to the top edge of our campsite, about 15 feet away from where we were making dinner. We spent four days in the area, and encountered four bears – two while driving, two in the campground. We ensured the kids stayed close (aside from them looping around the bike trails) and had bear spray on hand while on adventures, so I didn’t feel threatened at all. Mostly, the bears kept to themselves on the edge of the campground, near the woods or on the road. Interpretive Sessions for kids are close by, about a five minute drive, at Elkwood Amphitheater. On Saturday night, there was a session about bears that we meant to go to, but missed when we were distracted by S’mores and trying to dry off everything that had gotten wet in the full day of rain we received. There are sessions a few times a week, you can find the information at the Visitor’s center, or by park staff members walking around. Bundle Up. We learned quickly that we should have packed a heavier sweater for sleeping in, or sleeping bags that stood up better to the cold nights. This year, we’re better prepared with sleeping bags rated for lower temperatures for us, as well as the kids. Thinking about camping at Canyon Campground? It’s one of the best trips we’ve been on – arrive on Thursday, and you should be able to find a great spot. Go for a hike in Kananaskis!